A trick for standing exercises is to bend your legs slightly, taking pressure off your lower back, and stagger your feet to create more balance. As the weight gets farther from your body during the movement, you will need more force to overcome its relative weight. You need good balance and control. One of the biggest mistakes lifters make is to start the movement by launching the bar or dumbbell with momentum. Creating momentum at the waist causes the lifter to lean back, moving the tension from the biceps to other muscle groups. Lifters often cheat at biceps exercises when it gets most difficult, usually at the 90-degree angle. However, working through that sticking point will truly enhance overall improvement in the biceps. The desire to cheat by launching the weight with momentum is natural, but the best results will come if you force yourself to work harder when it gets harder. Developing the biceps takes time and patience. Don’t give up on them. Any pulling exercise will work these muscles. If you are having a difficult time developing these muscles, try isolating your arm muscles by inserting an arm-only day into your training program once a week. No single exercise can effectively target a specific area of the biceps, so your keys to success are performing a variety of exercises and using a full range of motion. Another good tip is to get a spotter to assist you. Don’t be afraid to get some help. Instead of using momentum and cheating through the tough areas, get a buddy to help you a little, and force your body to remain upright during the lift. 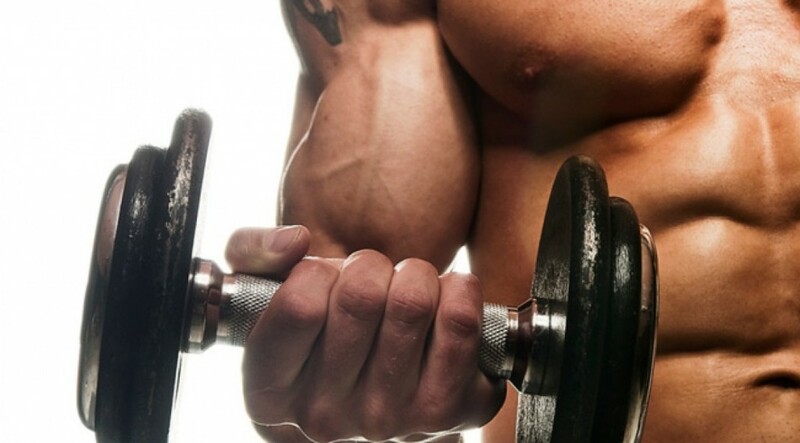 To really work your biceps, try 10 reps with a heavy weight, forcing the last few reps. Proper execution is the key to success. During triceps exercises, the less you move your elbow back and forth, the more you emphasize the triceps. Maintaining proper posture is a must. To keep proper posture, contract your abs and keep your chest up. Many lifters note that the abs feel as if they work during triceps exercises. This is a good thing because it means that proper body posture is being used. To get a true horseshoe-like appearance in your triceps, use the entire range of motion. That means using a smaller dumbbell and lighter weights. When you extend your arms, use a gentle lock at your elbows; do not snap them into a full lockout. Use a thumb-lock grip. A loose grip will prevent overexertion, but you need to be able to hold onto the barbell or dumbbell. The most important tip, however, is to make sure that the plates are secured to the barbell or dumbbell. You will quickly learn why supine triceps extensions are called nose breakers if a plate falls off while you are performing one. Although injuries are rare, olecranon bursitis (swelling in the elbow) may occur if you overdo it. If your elbow is sore, do not do triceps exercises. If you feel a slight pain during a particular exercise, try a different hand grip. It is not uncommon to find that some exercises bother the elbow but others don’t. Do not neglect grip work in your training, especially if you play tennis, golf, baseball, softball, or any other sport that requires you to hold a hitting implement. The heavier the weight you use and the slower you perform the movement, the greater the training effect will be. Using dumbbells with spinning plates allows the weight to move properly, but if you don’t have dumbbells with spinning plates, don’t worry. For the most part, if the dumbbell plates are secure, then wrist curls are safe. It is difficult to do any major damage unless you really overwork your wrists. The first few times you do these exercises, you may get sore, but in time the soreness will go away and your grip strength will improve dramatically.